The Prusa i3 MK2S is our default 3D printer in the 3D printer farm. We have five of them, named "P1" through "P5". In addition to receiving a personal introduction from one of the tutors, make sure that you have read the handbook and use the latest version of Slic3r available at the drivers and manuals page. exposed heated parts - may still be hot if the display is already turned off! machine parts may rapidly change direction - do not reach in when a print is running! no sensing of obstacles or current position! The printer "P6" has a multi-material upgrade! In the slicer, please select "Original Prusa i3 MK2 Multi Material" as the printer. Please read them while preparing for your first print. In case you have a specific support Material (e.g. 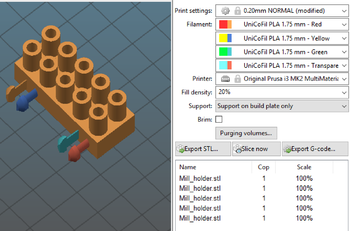 Soluble support), please see the settings at: Print Settings --> Multiple Extruders. Please note that Multi Material printing takes much longer than regular printing. After you exported the GCode, you can see the estimated printing time in the lower right corner. This page was last edited on 17 February 2019, at 03:31.